Last week I decided it was time I put in the hour and a half and watch Lady Bird. Saoirse Ronan is a great up and coming actress. She was amazing in Brooklyn in 2015 and her performance in Lady Bird was incredible. 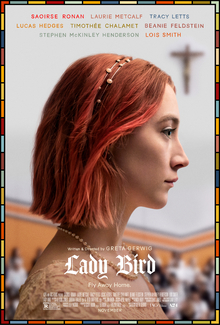 Set in 2002/2003 Lady Bird is a examination of a teenage girl who comes of age over her senior year of high school and first year away at college. With the current social climate there is no surprise that this movie is being rocketed to the front runners list at the Oscars this year. However, over the past couple of years I have seen some other coming of age films that are also great. Grandma (2015) and The Diary of a Teenage Girl (2015) come to mind as deserving of more recognition than what they received. Maybe if those movies came out in 2017 they would be our Lady Bird. What sets Lady Bird above those movies (arguably) is an incredible final 30-40 minutes of the film.